My cousin, Narissa, just got a laptop for Christmas and asked me about wireless security. I figure now is a good time to revisit this because she’s probably not the only one that received a notebook for the holidays. Fortunately, she’s thinking about security; most people probably just connect to open wireless access points without a second thought. Very scary. If you don’t want to use DD-WRT, make sure you’re using WPA security with a good password. I recommend Steve Gibson’s Ultra High Security Password Generator. People might scoff, but I don’t think I’m easily hackable. When you’re out, you’ll need to either pay for a connection that’s available or find a free hotspot. You can also buy a Wi-Fi card from a provider, like Verizon, but you probably don’t rely on your laptop that much to justify the cost. I stay secure wirelessly with the power of DD-WRT, PPTP, and VPN. That means that no prying eyes can see what I’m doing. If that’s too difficult to grasp (which it is for me, even though I got it to work), HotSpotVPN or PublicVPN probably would be best suited for you. (via GRC Security Now! Podcast #10) Those aren’t free, but fairly inexpensive. Also, prevent getting a branded notebook bag which screams, “I’m new and important – steal me!” I bought a SleeveCase from Waterfield Designs (SFBags.com), which then goes in my inconspicuous Jansport backpack or my Jack Bauer messenger bag. Timbuk2 also has a wide variety of notebook bags, which I’ve heard are excellent. By the way, do you notice that laptops are called notebooks now? They run way too hot to sit on your lap for long periods of time, hence the technical name change. Am I overly paranoid by worrying about people sniffing wireless packets? 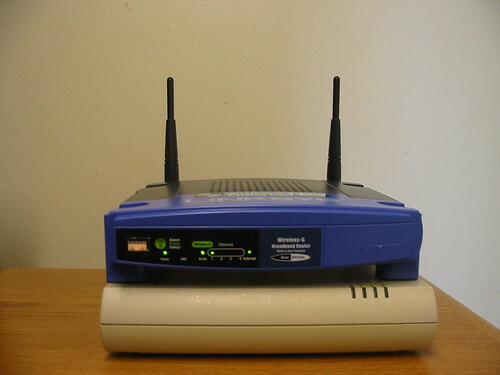 Have you thought about wireless security before reading this? Where do you buy non-branded notebook bags? Disclaimers: I’m not affiliated with Linksys, HotSpotVPN, PublicVPN, WaterField Designs, Timbuk2, or Jansport. However, I’m using an Amazon affiliate link for the Linksys router. Next Next post: Is Laptops For Less good?